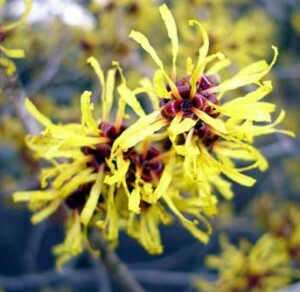 Witch Hazel, or as it is sometimes called Winterbloom, is shrub that produces flowers on leafless branches in the wintertime. It bears fruit of which some oil can be extracted and consumed and its leaves and bark are utilized for tonics and lotions. A natural painkiller Witch Hazel has sedative properties that have been used by the North American Indians too for inflammatory swellings. Extracts from the leaves and bark are used as an active ingredient in hemorrhoid medications and can be used as a treatment from insect bits, piles and bruises. The plant has a bitter astringent taste. When taken internally in tea or tablet form Witch Hazel is said to have remarkable results for those who suffer from bowel problems or internal bleeding of the stomach, lungs and other internal organs. Those who suffer from varicose veins may find lotions containing Witch Hazel will calm them; in fact, it's said that Witch Hazel applied to a burst varicose vein will instantly stop the bleeding having a life saving effect. Older generations used it as a household remedy to reduce the pain and swelling of burns and insect bites. Modern day organic skin care products including cleansers, toners, moisturizers, eye gels and deodorants contain Witch Hazel for it's soothing qualities.